We are very excited to announce that we’ll be at HOST in Milan as the Ingredient Supplier for the WBC All-Stars. The All-Stars competitors, which are made up from the creme de la creme of baristas from around the world, will be given the challenge of creating a signature themed drink using Sweetbirdand Zuma products. The All-Stars will then have to show off their all-round-amazing barista skills whilst designing the best (and most delicious) drink using the ingredients in the mystery box. We’ll be sharing the winning drink recipes next year so you can recreate your own All-Stars beverage for your customers. This year’s competition will take place from Oct 23rd – 27th. We’ll be keeping you updated on the show goings on at our Twitter and Facebook pages.This is also where we also host giveaways so give us a follow to stay in the loop. If you do something good, you do it again, right? That’s why we’re excited to co-host the South West Independent Coffee Guide launch party with fellow Bristol based company Extract Coffee Roasters. 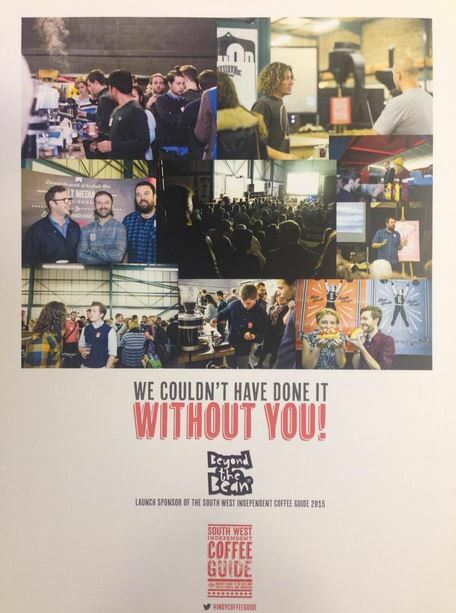 The chance to be involved in something coffee and geeky? Wild horses couldn’t stop us. Team Bean have been put in charge of the bar for the evening, so you can expect to be served a selection of local brew beers, cold brew coffee and special signature coffee based cocktails. If you haven’t read the guide yet, it’s your go-to-guide for the best independent coffee venues in the South West. Split by region; Cornwall, Devon, Somerset, Dorset, Bristol, Bath, Gloucestershire and Wiltshire – the guide includes maps and features on brewing, roasting & beans. Businesses only appear in the guide if they are independently owned, serve coffee from British roasted beans and represent the best in coffee expertise – so as you can imagine, the calibre is pretty high! The launch party will be hosted at Extract Coffee Roasters on October 16th. Stay tuned for more info and how to get tickets.